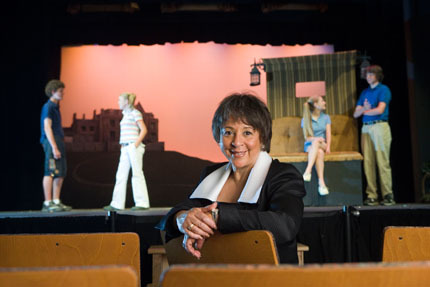 Sheila Johnson, formerly of BET, at the school where she donated the theater, with the students behind her perfroming, for a magazine. CONCEPT/OBJECTIVE: This magazine assignment was produced of the subject with a fair amount of pre-production and planning - moreso than many editorial assignments. The idea was to make an image that would illustrate the donation by Johnson to the local school. PRE-PRODUCTION: We had several conversations with the subject’s publicist, and talked about locations both outside and inside the school. The school had signed off on the shoot being there, and further, agreed to have students on hand, should they be needed. 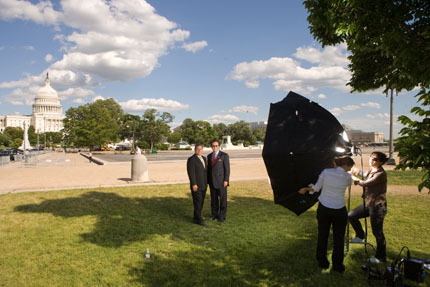 THE ASSIGNMENT: We arrived and set up outside with a single battery pack and softbox, as you’ve seen elsewhere here. We made a few images, but they just weren’t compelling. We then moved inside, and set up with the subject on the stage, on the steps to the stage, and so forth. There was a large area about 20’ x 60’ between the first row of “bleacher” seats, and that was problematic. In the end, we set up several chairs that were moveable (since the bleacher seats were not) and turned the one she was to be seated in, so as to provide more of an “open” feel to her. A single softbox on her from the right with a tungten gel on it to balance with the tungten of the stage lighting, as well as a daylight balanced rim light from the left, gave her some depth. Adding in the students and set from the show they were rehearsing were the final elements in making this image appealing. POST-PRODUCTION: As an editorial assignment, there is little post, besides a nominal balance of main subject and background lighting. FINAL ANALYSIS: Half-way into the shoot, with the outside image under my belt, and perspiring from the 90-degree-high-humidity heat, I was concerned about the final result. However, everything came together inside, and the client not only used it in their publication, but extended the rights package to online use as well.